As a dietary supplement, take 200mg of Nigella Sativa Extract powder once daily. What is Nigella Sativa (Black Seed Extract)? Nigella Sativa is an annual flowering plant in the ranunculus family (Ranunculaceae) that is primarily found in Southern Europe, North Africa and Southwest Asia. Nigella Sativa is also cultivated in a number of other countries including India, Pakistan, Syria, Turkey, and Saudi Arabia. Also known as Black Seed Extract, Nigella Sativa Extract has a long history of documented use dating back 2,000 years in traditional and Ayurvedic medicine systems. The name "Black Seed" is, of course, a reference to the color of this annual herb's seeds. Aside from their reported health benefits, these seeds are also sometimes used as a spice in Indian and Middle Eastern cuisines. The Nigella Sativa plant itself can grow up to about 12 inches tall and its flowers are usually pale blue in color but can also be white, yellow, pink or light purple. It is believed that thymoquinone, which is present in Nigella Sativa seeds, is the major active chemical component responsible for Nigella Sativa's reported health benefits. Traditionally, Nigella Sativa Extract has been used due to the belief that it supports general well-being and longevity. While Nootropics Depot offers Nigella Sativa Extract in powder form, Black Seed Oil is another common form of the extract available for purchase. Nigella Sativa Seeds also contain other non-caloric components including Thiamin (Vitamin B1), Riboflavin (Vitamin B2), Pyridoxine (Vitamin B6), Folic Acid, Potassium, Niacin, and more. While there are a number of active compounds found in Nigella Sativa including thymohydroquinone, p-cymene, carvacrol, 4-terpineol, t-anethol, and longifolene and others listed above; it is believed that the presence of the phytochemical Thymoquinone is largely responsible for Nigella Sativa's reported health benefits. 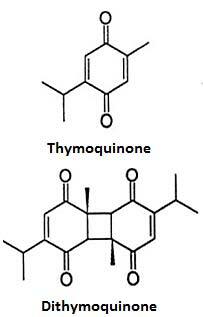 Thymoquinone is then converted to a dimer known as dithymoquinone (Nigellone) in the body. Both cell and animal studies have suggested that Thymoquinone may support cardiovascular health, brain heath, cellular function, and more. Thymoquinone is classified as a pan-assay interference compound which bind to many proteins indiscriminately. Is This Nigella Sativa Extract Standardized For Thymoquinone? Yes, this Nigella Sativa Extract powder contains a minimum of 5% Thymoquinone content. What Is The Difference Between Black Seed Extract Powder and Black Seed Oil Extract? One of the main active compounds in black seed oil which is responsible for its reported benefits is Thymoquinone. In regular black seed oil it is often only present at levels of around 1%. However, we have been able to source a Nigella Sativa powdered extract which has a whopping 5% of thymoquinone! Not only is this black seed oil powder very high in Thymoquinone, the fact that it is a powder makes it a lot easier to use. Oils are oftentimes messy to handle, however, powders can be far more easily contained and used in a variety of ways in which the oil cannot. For example, if you make your own powder blends with other ingredients, especially if you are making your own capsules then using the black seed oil powder is ideal. The black seed oil powder is especially useful if you are trying to target a specific amount of Thymoquinone. For example, with black seed oil, the maximum concentration of Thymoquinone, as mentioned earlier, is often times at around 1%. A common dose for black seed oil is around 500 mg to 1,000 mg. This means that a standard dose of black seed oil contains at maximum 5-10 mg of Thymoquinone. With this Nigella Sativa powdered extract, 500 mg of the powder would contain a very large amount of Thymoquinone: 25 mg. This means we can dose the powder much lower in comparison to black seed oil. A dosage that is equal to 10mg of Thymoquinone would only be 200mg of the Nigella Sativa Extract powder. The powdered Nigella Sativa Extract should also be slightly more stable than the Black Seed Oil during long term storage. So, if you are looking to enjoy the benefits of black seed oil, look no further than Nootropic Depot’s Nigella Sativa powder with 5% Thymoquinone. To gain more insight, read the Nigella Sativa Extract reviews below. Nootropics Depot offers 10 gram or 20 gram jar of high quality Nigella Sativa Extract powder (Black Seed Extract). Nootropics Depot's Nigella Sativa Extract has been lab-tested and verified for both product purity and identity. Black Seed Oil (BSO) offers many health benefits, making it incredibly versatile for whatever health goals you have. I have used high quality BSO from other companies for many years but I can definitely say this version of it, as an extract powder, is my favorite. I prefer my supplements to be in bulk powder form & had never seen a BSO powder before. This powder also has the highest Thymoquinone content of any BSO product I have used. This will be a staple in my supplement stack.